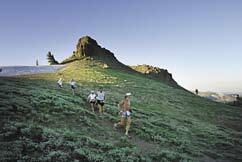 The Western States Endurance Run traverses the trans-Sierra portion of the historic Western States Trail, which stretches from Salt Lake City, Utah, to Sacramento, California. First used by the Paiute and Washoe Indians, the trail was later indelibly imprinted upon the high mountain ridges and through the deep river canyons by the boots of the ’49ers and the hooves of their horses and mules. For many years, the trail served as the most direct route between the gold camps of California and the silver mines of Nevada. Today, although portions of the trail follow dirt roads and three miles are on pavement, most of the trail remains in its natural wild state – the last intact crossing of the Sierra Nevada. Between Squaw Valley and Foresthill, the trail follows the historic track covered on 28 to 30 August, 1863, by Professor Brewer in his survey for State Geologist Josiah Whitney, as recorded in Up and Down California in 1860-1864; The Journal of William H. Brewer, Book 4, Chapter 5, Page 446. The description below divides the trail into six distinct sections. 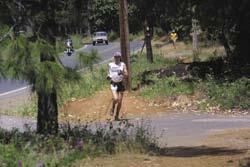 The Western States Endurance Run begins in Squaw Valley, California. Rising more than 2,500 feet in its first four miles, the trail crests at Emigrant Pass at 8,750 feet. It then passes through the Granite Chief Wilderness Area and follows beautiful, rugged Red Star Ridge to Duncan Canyon and Robinson Flat. This stretch, averaging 7,000 feet in altitude, passes through magnificent old-growth forest, and in many years has been covered entirely in snow. Leaving the Robinson Flat checkpoint, the trail climbs to the top of Little Bald Mountain before descending 1,043 feet to Miller’s Defeat. From there it follows fire roads and trails past Dusty Corners, around breathtaking Pucker Point and on to Last Chance, a mining ghost town that marks the jumping-off point for the section of the course known as “the canyons.” Learn more about the Last Chance mining district. The first of the canyons, Deadwood, drops about 2,000 feet and then ascends an extremely steep 1,500 feet to Devil’s Thumb. The second canyon, El Dorado, is more gradual but deeper, with a descent of 2,600 feet followed by an 1,800-foot climb to the old mining community of Michigan Bluff. This most rugged 13 miles of trail between Last Chance and Michigan Bluff is listed in the National Register of Historic Places. After the cold of early morning in the high country, runners may encounter temperatures as high as 110° F (43°C) while traversing the canyons. From Michigan Bluff , the trail follows the Foresthill Divide as it dips in and out of the small but difficult Volcano Canyon before reaching pavement for the first time on the outskirts of Foresthill. After a brief excursion through the relative civilization of “downtown” Foresthill, runners head back into remoteness on the California Trail, a 16-mile rolling descent to the bottom of the American River Canyon. Front runners will have to deal with the most intense heat of the day in this stretch, due to the oven effect of the mid-afternoon sun reflecting off the south-facing wall of the canyon. The next major checkpoint is Rucky Chucky, where the trail crosses the American River just below a class 6 rapids. When possible, the water flow is reduced on race day through retention at an upstream dam. Runners will have the benefit of a cable running from bank to bank, and numerous volunteers to help them if needed. In high water flow years, boats are used to transport runners. From Rucky Chucky, the trail climbs up the canyon to Green Gate and then follows gently undulating terrain through Auburn Lake Trails and Brown’s Bar. It then drops down to the river again before climbing to the Cool limestone quarry where it crosses Highway 49, less than seven miles from the finish. The slightly easier trail in this section is more than offset by the weariness of the runners, and the fact that most traverse this section at night by flashlight. As a result, many runners find this the most difficult part of the course. After departing the Highway 49 checkpoint, the trail passes through the magnificent oaks and grasses of the newest addition to the California State Park system, Pointed Rocks Ranch. 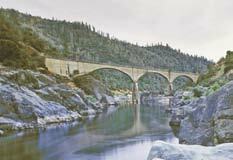 Then descending for the last time into the canyon, the trail crosses the American River on the historic No Hands Bridge, the longest concrete-arch bridge in the world at the time of its construction. No Hands, officially known as the “Mountain Quarries Bridge,” is listed in the National Register of Historic Places. From this lowest point on its entire length, the trail then begins the final climb to Robie Point and the outskirts of Auburn. Here, stepping onto pavement for the third and last time in 100 miles, runners are just 1.3 miles from the finish line at Auburn’s Placer High School stadium. After a short, steep climb followed by a half mile of flat, it is all downhill to the ultimate circling of the stadium track and the applause of crews and spectators. In late October 2007, the State of California took title to Pointed Rocks Ranch, the magnificent oak-and-grass meadow that we run through after clearing the Highway 49 aid station. 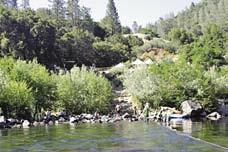 The ranch will be the first ownership by California State Parks in the Auburn Recreation Area, and sets a precedent for greater state involvement in the permanent protection of the American River canyon. This acquisition resulted from the partnership of the Trust for Public Land (TPL) and Western States 100; TPL provided the funds to secure an option on this parcel, and expertise and advocacy to secure the State buy-out. Western States contributed advocacy, and 20 years of initiative to save this land — once proposed for residential subdivision and a refuse transfer station — for future generations. On 24 April 2008, Senator Barbara Boxer, for herself and Senator Dianne Feinstein, introduced Senate Bill 2909, the Western States Trail Study Act. This bill represents the initial effort by Congress that can lead to designation of the Western States Trail as a National Historic and Scenic Trail. The bill will authorize the Forest Service to determine the eligibility of the trail for national historic and scenic designation, thus leading to further legislation that would bring the Western States Trail into this highest level of federal recognition and protection.